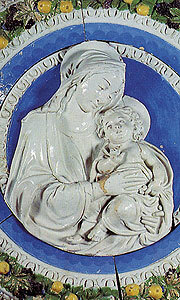 The intense activity of the Della Robbia family lasted a very long time, from the early decades of the 15th century to way beyond the second half of the 16th century: more than one hundred years which permanently influenced modern Western culture. The exhibition, opening on 21st February 2009 in Arezzo, and dedicated to this famous family of artists, will therefore be the opportunity to retrace plots, relationships, contests and, above all, to underline the close dialogue between all the arts which was the base of the Renaissance. Not only the multifaceted and fascinating story of the �robbiana� glazed earthenware art during the Renaissance, between 1430 and about 1580 - from Luca della Robbia�s ingenious �invention� to the extraordinary progress of this �new, useful and beautiful art� � but, most of all, and for the first time in an exhibition, its constant and rich �dialogue� with the �three sister arts� (sculpture, painting and architecture) and with the varied world of the so-called �decorative arts� (majolica, china, mosaic, glass, enamels, goldsmith�s art, marble and wood inlays, fabrics, prints etc.). Thus, earth becomes glass, sculpture is mixed with painting, it communicates with the goldsmith�s art, and captures the dazzling flashes of rock crystals and of mosaics in the �caprices� of the Della Robbia family, creators and interpreters of a new art, a combination of creativity, technique and craftsmen�s experience, whose original formula was kept strenuously secret for many, many years. 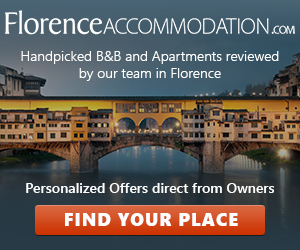 So in Arezzo, after Piero della Francesca, there will soon be another exceptional event, promoted by the Provincia di Arezzo, in collaboration with Comune di Arezzo, Regione Toscana, Camera di Commercio, Industria, Artigianato e Agricoltura di Arezzo, Banca Etruria, Soprintendenza per i Beni Architettonici e per il Paesaggio, per il Patrimonio Storico, Artistico ed Etnoantropologico per la Provincia di Arezzo and with the support of Toscana Promozione and Agenzia per il Turismo di Arezzo (Arezzo Tourist Board). 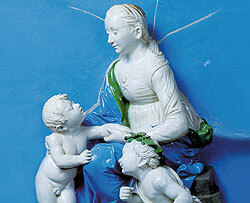 This exhibition will help you to rediscover an art intimately connected to its area, as you can see by the continual presence of the Della Robbia family in its churches, in its �palazzi�, and in the Tuscan cities architecture of the times, and so you will be able to relive the artistic epic of a century. Next to the extraordinary works by Luca, Andrea, Giovanni and Girolamo Della Robbia, you will be able to see the works created by other artists of this period, with whom they compared themselves in a profitable relationship �of giving and receiving�: Donatello, Ghiberti, Andrea del Verrocchio, Rossellino, Pisanello, Filippo Lippi, Ghirlandaio, Perugino, Desiderio da Settignano, Fra� Bartolomeo, Sansovino, Fra� Carnevale, etc. Carefully arranged by Giancarlo Gentilini and Liletta Fornasari and organized by Villaggio Globale International, with a Scientific Committee of the highest level, amongst whom are Cristina Acidini, Gabriele Borghini, Aldo Cicinelli, Maria Teresa Filieri, Vittoria Garibaldi, Mario Lolli Ghetti, Beatrice Paolozzi Strozzi, Antonio Paolucci, Bruno Santi � the exhibition�s starting point is the experience of Luca della Robbia. Leon Battista Alberti described him as being one of the Fathers of the Renaissance, who showed in his innovative �glazed paintings and sculptures� that he was capable of mixing and merging various art forms (stone sculpture tradition with the reborn clay sculpture, practice in �drawing� and therefore in painting, with mosaic decoration, goldsmith enamels with sophisticated oriental china), creating and initiating an original �genre�, unknown even in ancient times and which was a masterful and unequalled form of ceramic art, so that his works are truly �eternal and brilliant�. The arrangement of the exhibition for this event in Arezzo, which will also display some exceptional unknown works, is thus divided into thematic and typological sections, so that the characteristics, meanings, and the most distinguishing artistic and historical implications of the �robbiana� art will be clearly demonstrated. The basic theme is the �comparison� to painting which recalls many famous names: from the acquaintance of Luca with Filippo Lippi and from his meetings with Pisanello and Fra� Carnevale to that of Andrea della Robbia with Verrocchio, Perugino, Fra� Bartolomeo, right up to the challenge of the �modern manner� with the last Della Robbia generation working and researching with Raffaello, Andrea del Sarto, Gerino da Pistoia. 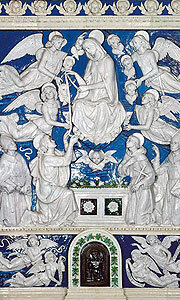 Their relationship with sculptors is equally interesting and fascinating, from Ghiberti and Donatello to Rustici and Sansovino; and with architects such as Benedetto da Maiano, emphasized by the fact that the invention of glazed earthenware art seems to have been sponsored and supported by Brunelleschi himself. In fact, he was interested in converting the expressive and functional values of mosaics into sculpture and painting, experimenting with ceramics an interesting and technical alternative to traditional mosaic art. All the members of the Della Robbia family were perfectly integrated into their local historical and artistic environment; they were actually amongst its most famous and admired citizens. Their art spread widely all over the centre of Italy and even crossed the Italian border, sought-after and greatly appreciated by the principal European courts. Thus began the tradition that, starting from the workshop in �via Guelfa� in Florence, can now be seen in the world�s most important museums, as is shown by the works of art on loan from Berlin, Paris, Rouen, St. Petersburg, and so on. Therefore, this is an ambitious and totally new exhibition which will allow visitors to reinterpret and to gain a deeper understanding into the meaning and value of an extraordinary art that changed the appearances of Tuscan cities and of which there are still many important examples in the Province of Arezzo. This exhibition thus becomes the heart of a route that takes you across this area - through the Casentino, Valdarno, Valdichiana and Valtiberina valleys � in various, extremely evocative itineraries where art and nature entwine together in a wonderfully fascinating combination.